Large, DAZZLING 30's "Arrowhead Star" Antique Quilt NICE BLUE BORDER! This EYE CATCHING cotton 30's "Arrowhead Star" quilt is hand pieced and hand quilted, with a nice blue border. The pattern is also known as "Michigan Beauty, " "Star of Many Points, " "Modern Star, " "Many Pointed Star, " "Beech Mountain Quilt, " and Laurel Wreath. It measures a generous 80" X 90" and is in excellent condition, with no spots or wear. There is quilting along the perimeter of each piece and in floral and vine designs in the background, all at an even 8-9 stitches to the inch. The back is a blue and white tiny plaid, the hand stitched binding is the solid blue, and the batting is thin. The LARGE SIZE, GREAT DESIGN, and NICE BLUE make this vintage beauty stand out! 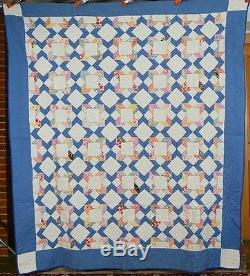 The item "Large, DAZZLING 30's Arrowhead Star Patchwork Antique Quilt NICE BLUE BORDER" is in sale since Friday, June 1, 2012. This item is in the category "Antiques\Linens & Textiles (Pre-1930)\Quilts\Completed Quilts". The seller is "french72" and is located in Yellow Springs, Ohio.